I covered this in my Jim Boykin buys WebmasterWorld live blog coverage but it didn't really get noticed here. 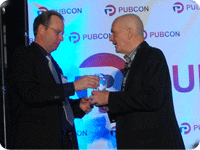 Ted Ulle, aka Tedster, one of the most giving individuals I know in the search community, was awarded with WebmasterWorld's first and maybe last, Lifetime Achievement Award. Ted has been the administrator of the Google forum for the past five or more years and been involved in the community for over 13 years. He has over 37,000 posts on the public site and over 20,000 posts on the private site. He gives his life to webmasters and does so with huge class. Ted has been one of the most outstanding moderators and admins I have seen on the internet in my 30 years of forum building. He is a proactive diplomat and is willing to work with anyone, regardless of who they are or where they live. He has had the unique ability to connect with people all over the world. His web development skills are second to none, and his SEO skills are beyond most books on the subject. We have been blessed and honored to know and work with Ted for all these years. I doubt there is a website on the Internet that hasn’t been touched by Ted in some way. From Fortune 500s to a massive list of independents, Ted has worked with everyone on some level. Thank you so much for all the service to the community Tedster. Congrats Tedster, it is well deserved but honestly, we all owe you a heck of a lot more than just this recognition.